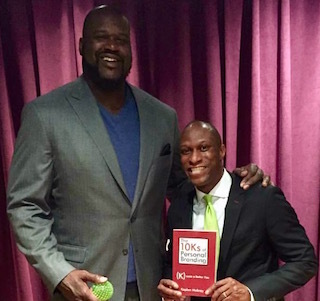 Kaplan Mobray, award-winning motivational speaker and author of The 10Ks of Personal Branding, provides this photo of he and NBA legend Shaquille O’Neal. The shot was gathered at the Verizon Theatre, in the Dallas/Fort Worth suburb of Grand Prairie, Texas. Shaq played in the Association from 1992-2011 and was one of the best players and centers of his generation. The LSU alum took the court for several teams, but had his best years with the Lakers, where he and Kobe Bryant helped lead LA to four NBA Finals appearances, amid winning three consecutive titles from 2000-2002. The early century Lakers were the last team to three-peat and could be the last to do so for a long time. After an acrimonious departure from the Lakers, Shaq later won his fourth title in 2006, with Dwyane Wade and the Heat. The now 45-year-old is easily one of the most famous and recognizable basketball players ever to play the game. He remains highly visible due to his continued commercial appearances, as well as his role on TNT’s coverage of the NBA. The 15-time All-Star and a three-time NBA Finals MVP was inducted into the basketball hall of fame in 2016.